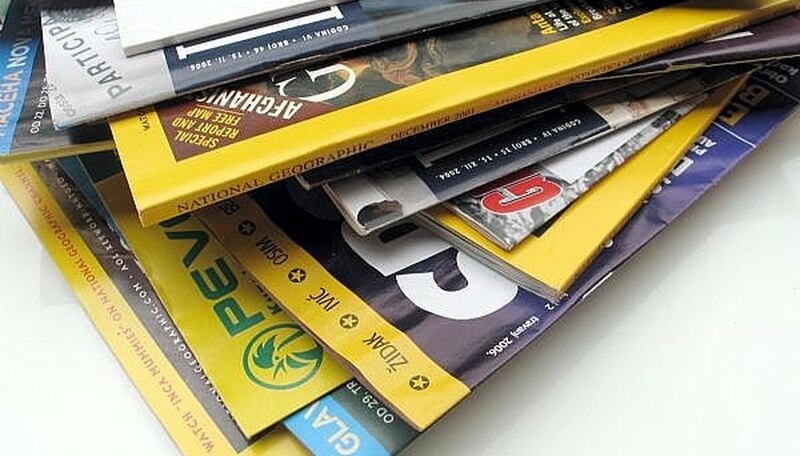 If you have a few subscriptions for magazines--or you purchase them from the newsstand--you may just toss them in the trash once you've finished reading them. But that's a waste! There are plenty of ways to recycle magazines before they get added to our overflowing landfills. Gather magazines. Gather them all in one central location, such as your dining table or living room floor. Sort your magazines. Sort them into the same categories you'd find in a bookstore, such as "Health," "Business," "Teen," or "Homemaking." Pass them along. Ask friends, neighbors, family and co-workers if they're interested in reading your magazines after you've finished with them. Give magazines to waiting rooms. Health magazines are appropriate for doctor's offices, and beauty magazines would be great for a hair salon. Offer your magazines to any business that has a waiting room. Donate them to schools. Kid-friendly magazines can be donated to schools, where teachers may use them for art projects. Donate them to literacy programs. Tutors may prefer to use magazine articles to teach reading, since they're shorter than books and the topics are varied. Use 'em for crafts. Many magazines have beautiful pictures that can be used for crafts like decoupage. Many cities offer recycling for glossy magazines. Check with your waste management facility. Some people are allergic to the perfume inserts in magazines. Always check before passing along a magazine with this type of advertisement.